Every fan in the Xpelair Classic range features a high-speed motor for maximum cooling power. Precision-engineered contoured impeller blades deliver optimal airflow efficiency, while there are three speed settings (low, medium, high) to suit individual needs. The whole assembly is finished in stylish chrome, bringing a touch of opulence to any room - without the opulent price tag. 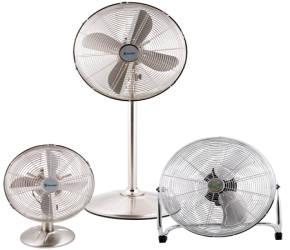 Available in three designs, the Xpelair Classic fan range suits a wide range of applications.